Over the past year, the total DADS holdings (HST and FUSE data) at MAST grew from 18 Tb (on March 1, 2004) to just over 23 Tb as of March 1, 2005. We have frequently seen monthly average retrieval rates in excess of 50 Gb per day, and sometimes as high as 100 Gb/day! Despite this, retrieval times have remained well under our target median of 24 hours --- in fact, for most of the past year, median retrieval times have been under one hour (see chart). While the HST archive dominates the archive in terms of data archived and retrieved, other datasets are utilized. MAST began archiving and distributing GALEX data products in November 2004. MAST now holds around 8.25 GB of GALEX image data. Since distribution of GALEX data began in November, 2004, MAST has distributed over 400GB of GALEX data. As subsequent deliveries are made, we expect the GALEX archive to grow to around 7 TB. See the GALEX article in this newsletter for a description of the types of data products and how to search for GALEX data. Total MAST Holdings are nearly 32 TB as of March 1, 2005. 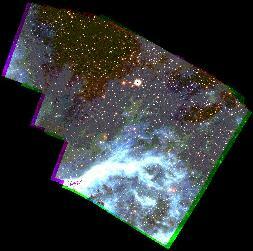 The Digitized Sky Survey (DSS) remains one of the most popular datasets that MAST maintains. An average of nearly 150,000 searches are made of the DSS each month. The plot to the right shows the number of datasets downloaded each month for each mission. Obviously the active missions are downloaded more often, but data from the older missions and short duration missions are still regularly used. It is interesting to examine the retrieval of spectra by instrument. 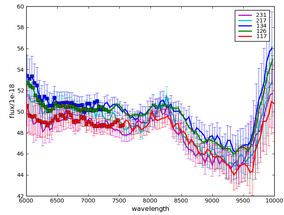 To the left is a plot of the average number of datasets retrieved each month per spectragraph over the past year. It becomes clear that on average, FUSE data are the most frequently retrieved spectral data, followed closely by STIS data. IUE also has a fair number of retrievals per month, even though the instrument has been inactive for nearly 9 years. The default orientation for pipeline MultiDrizzle ACS images ("*_drz.fits") has been changed to the unrotated image frame, instead of having North toward the top. This leads to smaller images which are easier to transfer and display, and can still be readily oriented North-up within most image display programs such as "ds9". More importantly, images delivered in the unrotated frame allow for instrument-specific effects to be much more easily identified and accounted for, including bad columns, stellar diffraction spikes, CTE trails, and PSF effects, and are also more useful for polarimetric, coronagraphic and grism data. The ACS CTE correction formulae can also be more readily applied to unrotated images. If images with North up are still required, these can be generated by appropriately setting the "final_rot" parameter when running MultiDrizzle off-line on the calibrated FLT files delivered from the pipeline. The default orientation change was implemented March 25, 2005 at 12:50 PM EST. High-Level Science Products (HLSP) are "value added" data products contributed by our users. They include processed images and spectra, object catalogs, and spectral and image atlases. Our collection of HLSP has grown considerably over the past year. In order to make it easier to find a specific HLSP, or to search for HLSPs that might be useful for a particular scientific question, we have created a new HLSP search interface that allows users to search by wavelength, type of product, and object type. The search page is accessed from http://archive.stsci.edu/hlsp/index.html. 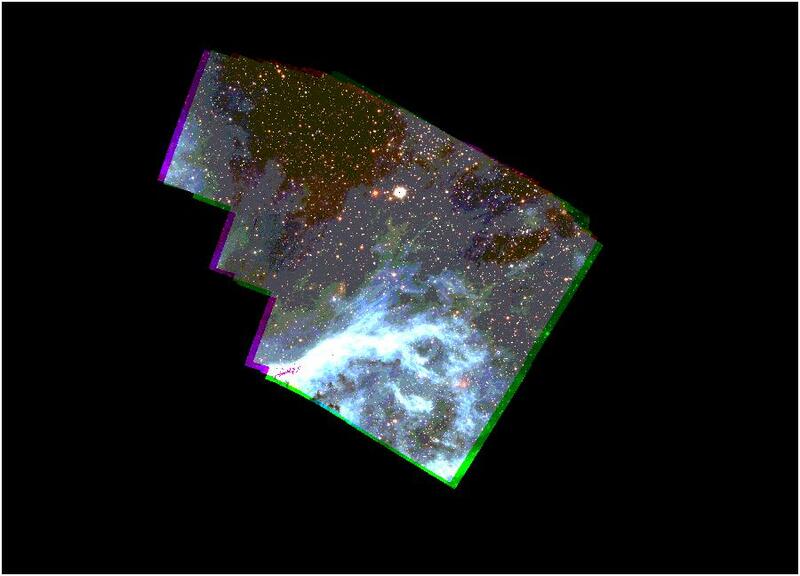 The deepest existing optical image of the sky, taken with the Advanced Camera for Surveys and NICMOS. Reduced images and object catalogs are available. 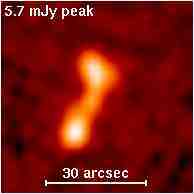 Version 2 of the NICMOS treasury data was archived in April 2005.
an atlas of recalibrated HST/FOS spectra of AGN and Quasars. This is a thumbnail of the preview for a part of the LMC at RA=84.5275 Dec=-69.0214. The product name is pu5hny501. Click on the thumbnail to see a larger preview. To the right is a thumbnail of the preview of the data for Beta Aqr. Click on the thumbnail to see the full-size preview. 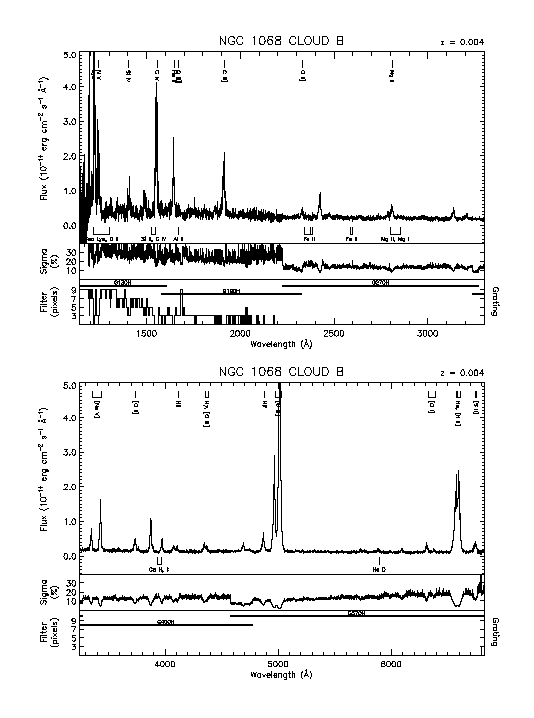 The products from the Grism-ACS Program for Extragalactic Science project are archive.stsci.edu/prepds/grapes/ slitless (grism) spectra obtained with the ACS in the Hubble Ultra-Deep Field (HUDF; PI Sangeeta Malhotra). To the left is a thumbnail of the calibrated spectrum for object number 3822 in the UDF catalog. Click on the thumbnail to see a full size preview image. Many of our users just visit MAST to download their data. However, MAST provides many sophisticated tools to search for, browse, and cross-correlate data. If you have a specific task that you don't know how to accomplish, or would just like to learn more about the capabilities of the MAST interface, visit our new web-based tutorial at http://archive.stsci.edu/tutorial/index.html. You will find a general overview of how to navigate the newly reorganized MAST website, a guide to the various interfaces, a summary of MAST Tools, hints for searching for and retrieving data, and a guide to further documentation. (http://archive.stsci.edu/mast_coplot.html) now has the option of displaying the average of "like" spectra. Two buttons have been added to plot just the average of like spectra or to coplot this average along with the constituent spectra. In both cases the mean spectrum is labeled "Average spectrum" and plotted in black. The averaging option works only for "like" spectra. The averaging option keys on the total number of points represented in the first (primary) spectrum (irrespective of the wavelength limits entered). The averaging option of the Coplotter is a "dumb" feature, meaning that it can be used only to compute averages from spectral files having the same number of total points, i.e. spectra observed in a common instrumental configuration. For example, an LWP or LWR IUE spectrum will not be properly coaveraged with an IUE SWP spectrum (or a HST/GHRS spectrum with another GHRS spectrum observed with a different grating). If a secondary spectrum is added which fails this equality-of-points test, the secondary will be overplotted but not coaveraged. Garbage in, garbage out! The averaged spectrum is a straight mean of the input flux vectors. One exception is that for IUE data, pixels with flags less than -512 are assigned zero weights and those data are not included in the average (even if corresponding pixels from other spectra in the coaddition have good flags). In the example to the right, three SWP low dispersion spectra of Capella and their average are shown. FUSE spectra are now included in the spectral part of the MAST Scrapbook (http://archive.stsci.edu/scrapbook.php). The plot to the right is the FUSE plot of the star HD 120991 (observation Q1140101000) that is the current "representative" FUSE observation for this target. Links to 2MASS images are now included in the MAST scrapbook (using data type = images). The 2MASS data (available as both jpg images and FITS files) are 20'x20' and are centered on the listed MAST observations. The VizieR search form now offers the ability to search on ADC-defined astronomical terms as well as keyword searches on author's name, catalog title, and catalog description. This allows searching on many object classes. SpecView, a sophisticated Java application for 1-D spectral visualization and analysis of astronomical spectrograms, is now available. SpecView is capable of reading all the HST spectral data formats, as well as data from a few other instruments (such as IUE, FUSE, ISO, FORS and SDSS), MAST spectral previews, and data from generic FITS and ASCII tables. It can also read and write spectrogram data in Virtual Observatory SED format. StarView was upgraded to version 7.3 in July of 2004. Version 7.3 features protocol to aid users behind strict firewalls, improved database connectivity, and many improvements that enhance performance, reliability, and usability. Please visit http://starview.stsci.edu/html to download or learn more about StarView. Visit our web page at http://archive.stsci.edu/vo to read about how MAST is participating in the National/International Virtual Observatory. This page also provides useful VO-related links. Check this site for updates about our ongoing activities. A more general site devoted to VO activities at STScI is http://nvo.stsci.edu. UIT image and preview data are also available via SIAP. High-Level Science Products including GOODS Version 1, the UDF ACS and NICMOS data, the HDF and HDFS and several other sets are available via the SIAP service. SIAP. GALEX Early Release Observations and some HST datasets (the HDF North and South, GOODS, and the UDF) are now incorporated in a SkyQuery prototype (http://www.skyquery.net). SkyQuery is a prototype of a Federated database application, implemented using a set of interoperating Web Services. This is a demonstration of how typical applications in the Virtual Observatory may look. MAST holdings can now be searched simultaneously with data from many other surveys and missions through the Data Inventory Service (http://heasarc.gsfc.nasa.gov/cgi-bin/vo/datascope/init.pl), developed for the National Virtual Observatory and hosted at HEASARC. The survey and mission data in the DIS currently include SDSS, 2MASS, RASS, HST, Chandra and EGRET. STScI staff continue to be active in National Virtual Observatory development activities. In September 2004 we led the organization of the first NVO Applications Software Development Summer School, in which 40 graduate students, post-docs, and software developers spent a week learning about NVO tools and technology at the Aspen Center for Physics. We also held a special session on NVO-enabled research at the January 2005 AAS meeting in San Diego. Several talks featured results from student projects at the Summer School. The San Diego AAS meeting was also the venue for the NVO project's first substantial public software release (details at http://us-vo.org). NVO developments were featured in many of the talks and posters at this year's ADASS Conference (October, Pasadena), including new VO-compatible features of MAST. International VO collaboration centered around the "interoperability" meeting held in Pune, India, in September 2004. MAST began distributing data products from the GALEX (Galaxy Evolution Explorer) satellite in November, 2004. This distribution continued with four sub-releases that through December, 2004. The first subrelease, called "GR1a," consisted of image products for the Medium Imaging Survey (MIS) and Nearby Galaxy Survey (NGS). Subsequent subreleases GR1b-d included image products from the All-sky Imaging Survey (AIS; GR1b) and Deep Imaging Survey (GR1c). Release GR1d consisted of spectroscopic products for the Medium and Wide Spectroscopic Surveys (MSS, WSS). Users can access GALEX data from the MAST website at http://galex.stsci.edu. Click on "Search" on the left menu to initiate a search using either a "MAST-style" search form or a customized SQL-based search form. You can download data file by file via your browser or for an entire dataset via ftp. Recently the GALEX team implemented CASJobs Batch Query Services which allows enhanced and personalized SQL access to the GALEX databases. If you register, you receive local storage on the server, where you may create tables using the "select into" statement. This storage is called MYDB. Tables that you create in MYDB may be extracted to FITS, VOTABLE, or CSV using the extract page. You control your MYDB, and you may drop tables in it to make more space. MYDB is a proper database and you may join tables in MYDB with tables in any GALEX target database. There is a users guide. Other documentation is linked from the main CASJobs page. CASJobs is made possible by the Sloan Digital Sky Survey Collaboration. MAST conducted a User Survey in January, 2005, to gather information that helps us support our users' needs and to prioritize our plans for improving and expanding archive services at MAST. We thank all the users who took the time to respond to the survey. We received responses from 288 users. Of those who responded to the question, 251 were non-STScI employees and 32 were STScI employees. You can browse the results of the survey at http://archive.stsci.edu/surveyresults/survey_jan2005.html. We have also prepared a response to some of the comments we received, which may be of general interest to many of our users. This response is at http://archive.stsci.edu/surveyresults/response2005.html. We find that the responses that our users give us as part of the survey are often the most interesting and useful aspect of the responses. We administer a survey once a year or so, but value responses and suggestions all year. We have implemented a "suggestion box" at http://archive.stsci.edu/suggestions.html and encourage you to post suggestions, comments and concerns through this interface. A link to the suggestion box is found on the second line of the top menu on most MAST web pages. While you may post any comments anonymously, often it would be extremely useful to ask you for further clarification or feedback on implementation in response to a suggestion so providing your email address is an option. We anticipate that the responses to some suggestions or comments will be of interest to the wider archive user community, while we understand that some queries may divulge science goals that users would prefer not to make public. So, therefore we ask you to tell us if we can post your comment and our response on the web. All postings on such a website will be anonymous even if you have identified yourself. MAST held the annual meeting of our Users' Group on February 17, 2005. The MUG members in 2005 were Ann Zabludoff (Chair), Tom Ayres, Anton Koekemoer, Jeff Newman, James Herald, and Aki Roberge. The MUG provides us with important feedback from the user's perspective, helps to set priorities and suggests directions for future enhancements to the archive. 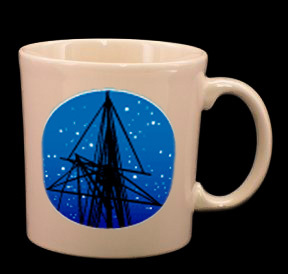 You can read the MUG's report from this year and previous years at http://archive.stsci.edu/mug/. MAST is a member of the Astrophysics Data Centers Executive Council (ADEC; http://www.adccc.org/), which coordinates activities between NASA's data centers (ADS, HEASARC, IRSA, LAMBDA, MAST, NED, NSSDC/ADF/ADC) and largest active mission operations centers (CXC, GLAST, Spitzer Science Center, STScI). The ADEC has recently developed a recommended naming convention for referencing datasets in the astronomical literature. As of January 2005, the publications managed by the AAS provide authors with a mechanism that allows them to make links between their articles and the observational data that is presented in them using these "dataset identifiers". The dataset id's are specified as keywords in the AASTeX manuscript. Eventually, these keywords will be required by the journals. For more information on the naming conventions, see http://archive.stsci.edu/pub_dsn.html. To verify the existence of particular MAST data sets using the standard naming conventions, and display the recommended data set reference following the AAS guidelines, go to http://archive.stsci.edu/dataset_verifier.php. More information on the proposed dataset identifiers and how to specify them in an AASTeX manuscript can be found at Chandra web site at: http://cxc.harvard.edu/cda/datasetid.html.